Our uniqueness as individuals makes everyone special; no two people are the same. Even identical twins have differences; whether they are emotional, psychological or spiritual. Some of these differences come from heredity, others from nature. However, many are due to circumstances during our developmental years – nurture. These traumas of life can define who you become, how you act and react, and why you think the way you do. Often, this “thinking” is the product of your mind’s defenses, created by your experiences—and your mind will not cede these habitual ways of thinking easily, even if they’re hurting you. 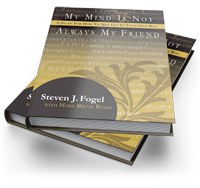 In My Mind Is Not Always My Friend: A Guide for How to Not Get in Your Own Way (Fresh River Press, 2010), Steven J. Fogel, along with co-author Mark Bruce Rosin, share the insights Steve unearthed during a life-long journey of exploring the emotional, psychological and spiritual mysteries that lead to a fulfilled life. What if your mind was sabotaging you? What if what you’ve learned was not true and a barrier? What if you could learn to take control of your mind and remove these self-imposed barriers that block the way to happiness and true success?